Several weeks ago, I finished a little floral summer skirt made from a medium weight cotton/linen fabric purchased online from Michael Levine. I purchased the fabric 2 years ago and it has since been sold out. I love the "denimy" blue background color. The roses remind me of my mother who loved all flowers but especially roses. The motif also reminds me of a couch I once had - ha ha! The skirt is self-drafted but you can find a similar pattern from one of the big pattern companies or independent pattern companies. 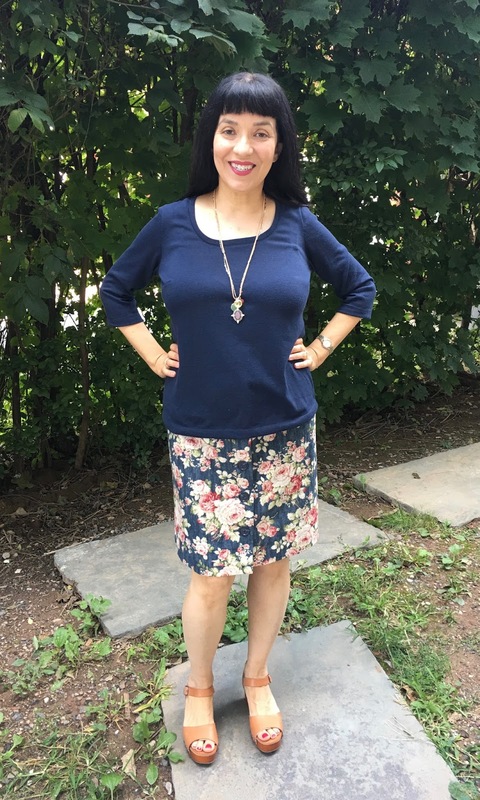 I am wearing it with a self-drafted knit top I made some time ago. I would like to make a little woven top to go with it. Maybe in a navy blue or perhaps I will pick up one of the colors from the print. Anyway, I don't know when I will get around to making a top for it. It has been so cool here in the Northeast U.S. It feels like fall weather came way too early. Unless we get a few hot days, I will wear the skirt next year. But I did not have enough fabric to match the sides which I am ok with. Below are views of the side and back. so I could stitch in the ditch from the right side. I find this method reduces bulk and creates a polished treatment. What do you think of the buttonholes? Beautiful, yes indeed!! I got them done at Jonathan's Embroidery, 256 W. 38th Street between 7th and 8th Avenues. You mark the buttonhole placement on the fabric and tell them what type of buttonhole you want. 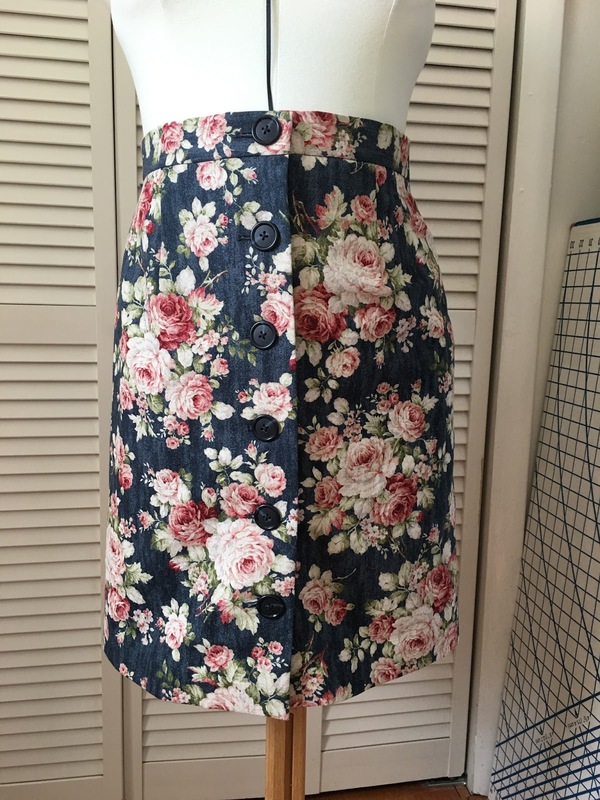 You bring a button with you and a sample of the fabric so they can make a test buttonhole for you before they proceed with your garment. They use industrial machines that create beautiful buttonholes. They also use gimp to prevent the buttonhole from stretching over time. The machines punch a hole (in the case of the keyhole buttonhole) and create a little slit. You then finish opening the rest of the buttonhole at home. They charged me $1 per buttonhole. If you ever have the opportunity to get buttonholes done professionally, do it because it is definitely worth the effort. This skirt is so beautiful Tomasa! You did a phenomenal job, inside and out! Also, I love that you got the buttonholes professionally done. I will keep that in mind for bigger projects. Thank you so much Vanessa! I am very happy with the buttonholes. I love the pink roses on that blue background Tomasa. $1.00 per buttonhole - Wonderful! Thanks Faye! I love the fabric print also. When I see a garment constructed with all off those beautiful details, I wonder what someone handling it 100 years from now would think! Lovely inside and out. Thanks so much Barbara! I hope the garment lasts that long. My daughter says that she likes it so....maybe! What a beautiful skirt! 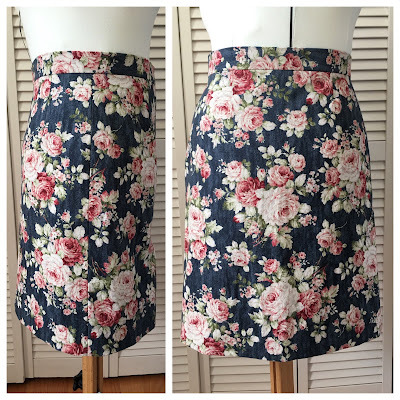 I'll bookmark this post to try your waistband finish next time I'll make a skirt! Thank you Marianne! 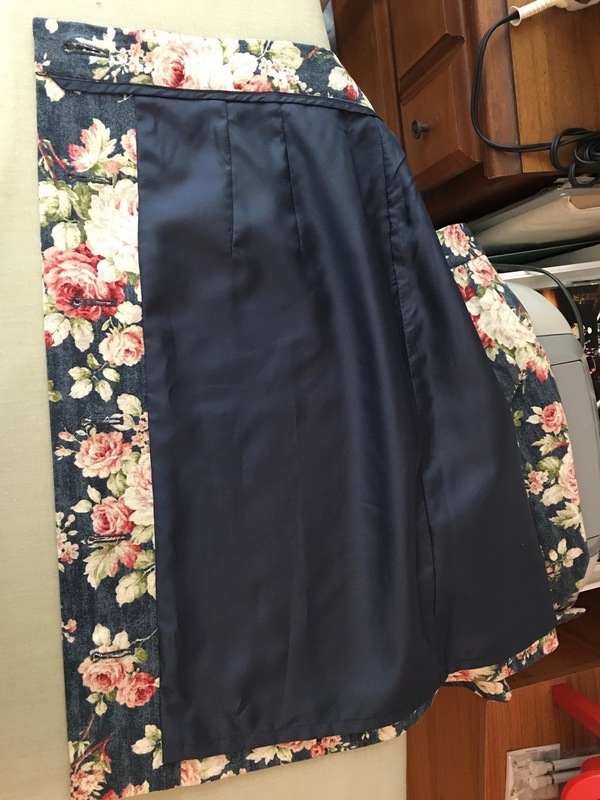 I use this same waistband finish for pants as well. Perfect fit and perfect front matching. I always admire matching up the print patterns. Thank you Connie! I enjoyed matching the pretty roses. What a beautiful print and I love the button front. 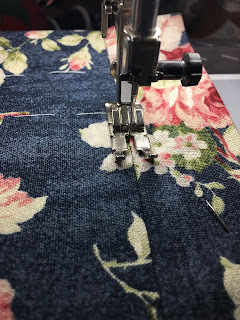 $1 a buttonhole is not a whole lot for a touch that adds so much to the finished garment. Thanks Elizabeth! Yes, $1 per buttonhole was well worth it. I love the rose patternd fabric and the button front! These buttonholes are perfectjob I think. It's good for autumn. Thank you Eli cat! I love the fabric as well. What a beautiful skirt! The print is so gorgeous. You did a perfect job. Thanks so much! I too love the feminine print. Your skirt is really lovely! The fabric and lining no go so well together. Thank you! Luckily, I had that lining in my stash. The skirt is adorable and looks so pretty on you. .Love that fabric. job and only a $1 each.. I would take ALL my button hole needs there, for sure..smile. ps .. it has turned cool here too.. Fall is early.. Thanks! I am lucky to live near the NYC garment district so I take advantage of it when I can. Its beautiful inside and out. I love a hongkong finish. And the buttonholes are amazing too. Oooh to have NYC on your doorstep! Simply gorgeous, Tomasa! Well done! Thanks so very much, dear Tany!